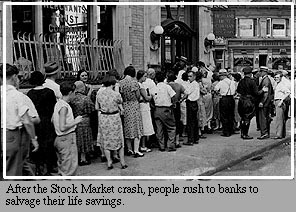 The 1929 New York Stock Exchange crash and the failure of important European banks plunged the entire world into an economic depression. Japan was hit especially hard. With practically no natural resources, the nation had to import oil, iron, steel, and other commodities to keep its industry and military forces alive. But to buy these things, it had to export goods for sale abroad. 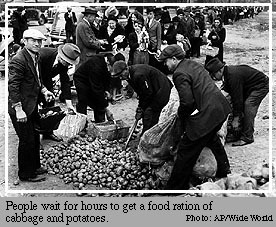 This became harder to do in the early 1930s as nation after nation, including the U.S., raised tariffs (taxes on imports) to protect their own struggling industries. As Japan's economy grew worse, the country became more aggressive. One way Japan could gain greater access to raw materials and markets was to increase the amount of territory under Japanese control. Generals and admirals, working together with leading industrialists and financiers, dreamed of a Japanese empire that would bring "the eight corners of the world under one roof." They campaigned against politicians who stood in their way. In 1931, Japanese Army officers seized the resource-rich region of Manchuria in the north of China. The government in Tokyo didn't approve of the plot, but the Army went ahead anyway. Within a year, Japan controlled Manchuria. What did the Japanese militarists mean when they spoke of "bringing the eight corners of the world under one roof?" What are the eight corners? How would a Depression affect your life today? How do you think a bank failure in Europe can affect the lives of Americans?